Healthcare in the capital is set to undergo a major shift with families asked to “plug the gap” in a bid to relieve pressure in the provision of care for frail and vulnerable people. The Edinburgh Integration Joint Board (EIJB), which is responsible for care in the city, is set to undergo a “major culture change” that will see the onus placed on patients to look after themselves or receive help from relatives. The move comes amid a crisis in the capital, where health chiefs allocated a £4.5 million emergency fund last December to tackle the “immediate pressure” caused by the delayed discharge of patients waiting in hospital to be assessed for a care package. As of March there where 267 delayed discharges against a target of 50 and the number remains “critically high”. In addition to this, a Care Inspectorate investigation in May last year into the quality of care provision in Edinburgh found that five out of nine factors of care were rated “unsatisfactory” or “weak”. And the EIJB is facing a funding shortfall of £12.4m in 2018/19, assuming savings of £11.1m are made. Health chiefs are now set to have a “big conversation” with the public about what might be deemed a reasonable contribution from individuals, their relatives, neighbours and local communities to provide elements of social care for themselves. The EIJB has launched an action plan to get to grips with the service. Judith Proctor, chief officer for the Edinburgh Health and Social Care Partnership, said: “The report sets out some of the short, medium and long term plans that have been agreed to begin to make a focused impact on outcomes for people. It details not just the immediate pressures but the shift in the way we work - that will include culture change and significant investment. “The new approach will include a shift towards preventative and early intervention activity that will reduce dependency on acute services and crisis support. Established in April 2016 as part of the Scottish Government’s flagship reform to integrate health and social services, the Edinburgh Health and Social Care Partnership covers mainly the City of Edinburgh Council adult and social care services and NHS Lothian community health services. Ricky Henderson, chairman of the Edinburgh Integration Joint Board, said: “Supporting people to live as independently as possible in their own home and community means we need to think carefully about how our invaluable health and social care services are provided. He added: “Some of these approaches have been adopted on a trial basis since March and the results are hugely encouraging, with the backlog of assessments reducing steadily month on month. 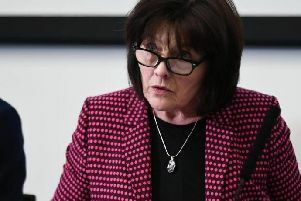 However Shadow Health Secretary Miles Briggs said: “I fully understand Judith Proctor’s vision of more preventative care and supporting individuals to maintain their independence, but this will not be an easy transition. “Social care has been under increasing pressure over the last two years and delayed discharge has been steadily increasing in hospitals.